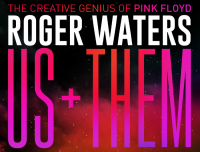 Continuing the trend of a gradual release of 2018 Us + Them tour dates for Europe, today it has been announced that Roger Waters will be performing four shows in Italy, and one in Latvia and Lithuania. The Bologna concerts are unusual in that the promoter states the first of the pair is a standing show, the second is seated. Tickets for the Italian shows will be available via Ticketone.it. For the Latvian show, tickets are from Bilesuserviss.lv, and for the Lithuanian show, Bilietai.lt.